I wore this outfit last week on my way to grab dinner with Stan. 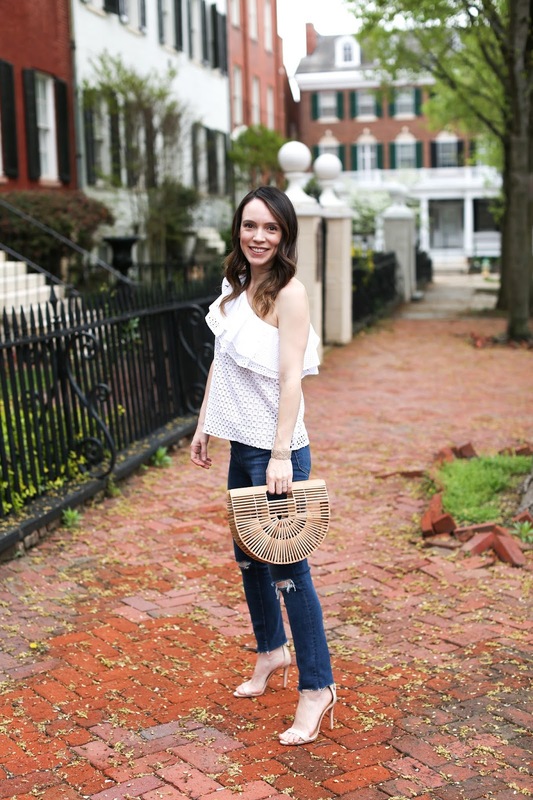 One of my favorite looks for nights out is a feminine top and a great pair of jeans (much like this look and this one). It's seems like such a cliche combo, but I will never tire of it! While I have some jeans with tons of distressing, I like minimal amounts for looks like this. I fell in love with these jeans because they were such a classic color and the distressed knees were much more understated which look great when I want to dress them up. The jeans initially had a staggered hem, but as with almost all my jeans the inseam was way too long for me so I had to cut off a few inches. I ended up liking the look better this way since it contributed to the more classic look of them. Typically when fraying my jeans, I use a simple pair of scissors (though I have heard garment shears are better - I probably need to pick some up) and then throw them in the dryer a few times to get the fabric to fray. This J. Crew top is the cutest style for spring and summer, though I do advise sizing down since it runs quite large as I find with most of their clothes. Their vanity sizing has really gotten out of control these past few years - anyone else think so? I started to laugh when I saw 00 and 000 sizes popping up - how far down can they go? LOL While much of their stuff can be hit or miss for me, I still like to shop their on occasion for fun pieces (like this look, this trench and this bright top). That top is increbile! I'm loving the cold shoulder trend at the moment and I've been on the hunt for a good asymmetrical feminine shirt. I hope you had a good time! Thanks!! 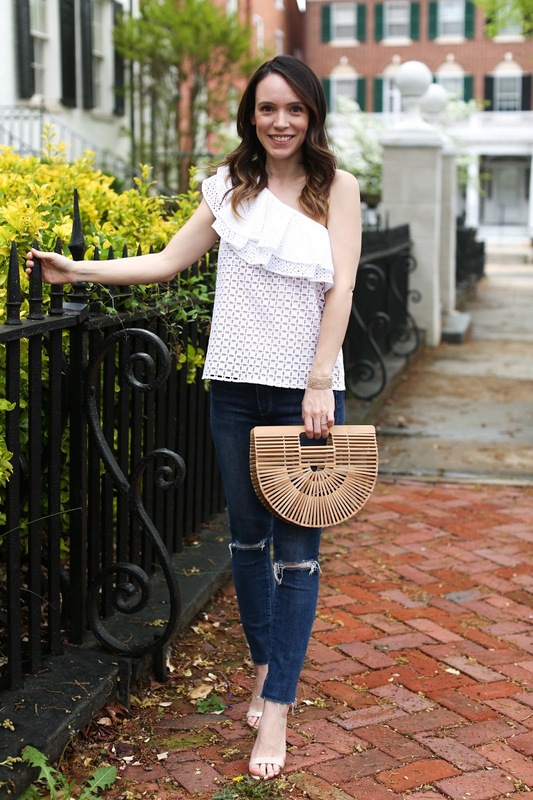 I am loving the cold shoulder trend too! I'm a terrible commenter, though I read everything you write, but I had to laugh when I saw your JCrew comment. I definitely agree re: vanity sizing! I used to be a 0P in their tops. Now their 0 Petites are tremendous, except for every once in a while, when I size down and get something that won't even go over my head. It's a pity, because they are (mostly) still using cotton and silk, and I'd like to support that... but not without free returns!